Regardless of age, we all need a little boost to our memory. The mind needs regular stimulation and exercise to stay strong, healthy, and sharp. Studies have shown that just as little as 10 minutes a day can help. Below are three great resources for free brain games. This non-government group founded in 1958 caters to people age 50 and over. They are a membership organization that lobbys, advocates, provides information, insurance, just to name a few. You can visit their site directly at www.aarp.com to learn more. In addition to all of the wonderful things they do, they also provide a number of brain games for free on their website. All of the games are intended to challenge your brain and to get your memory working. Some games are easier than others, while many have various levels that you can progress through. Word Search – Simply click and drag your mouse over the word to get points. Just as any word search the words may be found horizontally, vertically or diagonally. It’s lots of fun and you won’t believe how quickly the time flies. 5 Roll – This game is one of the member favourites and you will find it quite often holding the number one position in their ‘Top Games’ list. It’s all about rolling the dice. All you do is roll the dice and get the highest score. However, there is some strategy and skill involved as you have to figure out which dice you should keep. 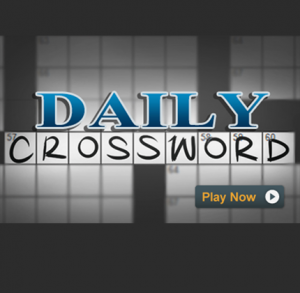 Daily Crossword – Another favourite is the daily crossword. Just as you would typically see at the back of a newspaper or magazine this digital version has the same appeal. Eggz – The aim of this game is to get to the top of the wall by matching coloured eggs so they disappear and get out of your way. This game is on a timer so essentially you are racing against the clock. Lots of fun! Click here to access all of their top rated games. This website simply offers a number of links to play great brain games. Dragger – This game involves dragging pieces of a picture to form an image. Very much like a typical puzzle except all the pieces are square so you have to rely completely on matching up the images. Memocoly – In this brain game you have to remember the flashing colours in the sequence that they appear. You click on the colours as many times as it originally showed to score points. Rotate – It seems really easy at first, but it can get very tricky. In this game you are given a picture with a number of square pieces that have been rotated the wrong way. You click on the piece to get it to turn clock wise. When you think it is in the right position you leave it. At the end you will see the picture clearly. The parts of the image with strong edges are easy to match, but other parts are quite blurry so you really have to focus to make sure that you have rotated the piece the right way. Click here to access of the games. This website categorizes their games so that you can quickly find exactly what you are looking for. Some of the categories include, memory, logic, strategy and so forth. As well, they list their top 5 games so you know which ones people are enjoying the most. Moving Memory – This game is very challenging. You have to click on one of the squares to reveal a piece underneath then you have to find the matching piece with as few moves as possible. But here’s the hard part the board is moving so even when you think you found the matching piece it is hard to find it. Great game, but requires some real patience. Mouse Trap – Their number one spot goes to this game. Here you have to trap a mouse by building pillars around it so it can’t move. Sounds simple, but not really. You have to try to think of where the mouse might go next and start building the walls. The only problem is that while you may be building on one side the mouse has already gone the other way. Maze – A great game for anyone of any age. Get the ball through the maze using the arrow keys on the keyboard. To play any of these games or to visit their entire selection go here http://www.sheppardsoftware.com/braingames/braingames.htm. While this list offers games that have been specifically geared towards improving the memory any game that requires strategy can potentially have a positive effect. Moreover, most gaming companies offer a number of games for free or with trial periods. This allows you to test the game to see if it is something that you would like. When looking for games on regular game sites like www.popcap.com or bigfishgames.com you want to look for matching games, puzzles, word games, or any type of solitaire.